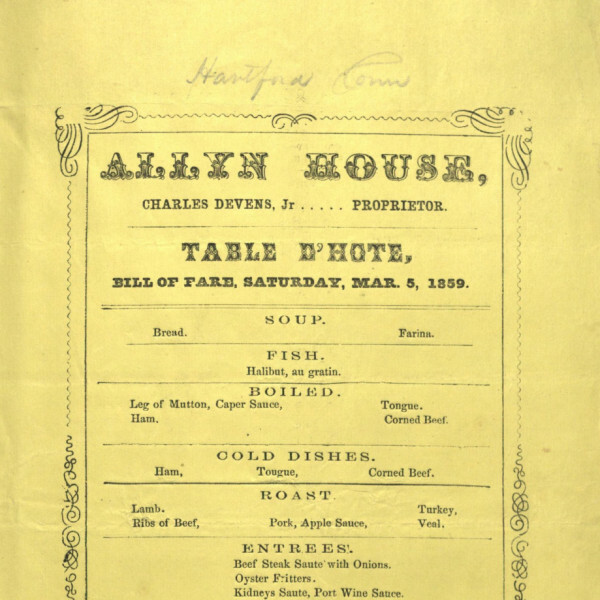 Description: Menus from hotels, restaurants, and steamboats in the 1850s and 60s. The name CHARLES DEVENS, Jr, Proprietor, is prominently displayed at the top of this menu. Permission: This image is in the public domain and may be used freely. If publishing in print, electronically, or on a website, please use the citation: "Courtesy of Special Collections, University of Houston Libraries." To order a higher resolution reproduction, see http://info.lib.uh.edu/about/campus-libraries-collections/special-collections-archives/request-digital This work has been released into the public domain by its author, University of Houston Libraries. This applies worldwide. In some countries this may not be legally possible; if so: University of Houston Libraries grants anyone the right to use this work for any purpose, without any conditions, unless such conditions are required by law. This page was last modified on 19 April 2017, at 15:15.